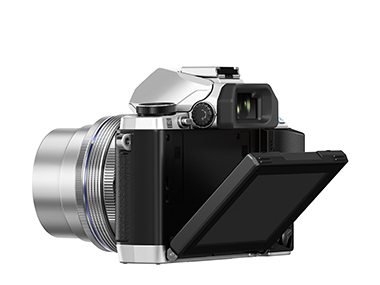 Olympus has launched a baby brother version of its OM-D compact system camera in the shape of the E-M10. The third member of the OM-D family features the design and focusing speed of the OM-D E-M5 – but in a smaller body with built-in Wi-Fi (for remote shutter release via a smartphone during long exposures, for example). Pitched against DSLRs such as Canon’s EOS 700D, the micro-four-thirds newcomer houses the same TruePic VI imaging processor as the top of the range E-M1 and delivers a performance close to a “mid-DSLR’, claims Olympus. 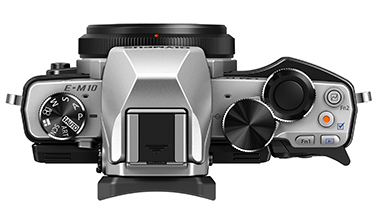 Billed as the most compact of the OM-D family, the metal-bodied E-M10 sacrifices the on-sensor phase detection (featured on the E-M1) and has no hotshoe-based accessory port, for example. A new image stabilisation unit has been used to help make the camera body smaller and lighter, said Olympus’s SLR products planning manager Toshi Terada in an interview with AP. Olympus claims that the 1.44m-dot EVF is the fastest in the EM series. A larger, optional, [EP-14] eyecup will be available for glasses wearers, while larger buttons have been added following customer feedback on the EM-5. Also on board is a minimum ISO setting of 100, a claimed eight frames-per-second burst rate, plus a pop-up flash. The camera deploys Small AF Target and Super Spot AF in a move designed to enable zooming and accurate focusing on ‘minute sections of the frame’. Olympus has today upgraded the firmware in its E-M5 to offer an ISO setting down to 100 and Small AF, as included on the E-M10. Designed as an everyday camera for ‘discerning hobby photographers’, the E-M10 sports a 3in, 1.44m-dot, tiltable LCD screen and three-axis image stabilisation. The E-M10 is due to go on sale this month priced £529.99, body only. It will also be available as a kit with a new ‘super-slim’ M Zuiko Digital ED 14-42mm f/3.5-5.6 EZ [electronic zoom], priced £699.99. Terada told AP that the £299 lens – trumpeted as the thinnest pancake zoom on the market – has the same diameter as the previous 14-42mm model but uses a high-refraction lens to enable it to retain the same specification. It deploys an ED lens to help correct chromatic aberration. Meanwhile, Olympus is also poised to launch a new 25mm f/1.8 lens, following customer demand. There will also be a new 9mm bodycap lens containing five elements in four groups and two aspherical elements. The 25mm lens, due in March, is set to cost £369.99 and will bring Olympus’s micro-four-thirds lens portfolio to 14. A price for the bodycap lens has not yet been announced.